The Mana Cruising Club has the capability of lifting vessels in and out of the water together with hard stand facilities. This service is available to both our members and non members. Haul outs and cradles are booked by filling out the booking form below. 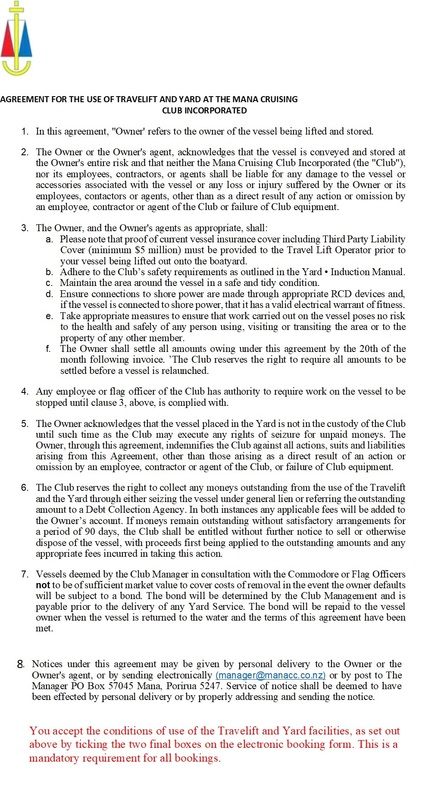 Please read our Travel Lift Terms and Conditions. You are required to acknowledge you have done this and agree to the terms and conditions. View our full list of services, rates, hints and tips for your lift or download a copy of our schedule of current services and rates. While we will endeavour to meet your requirements, operational issues may be beyond our control. We will confirm receipt of your booking via email. Please complete the following form to book Yard Services. Water blaster (after first hour). Select Preferred Dates for your booking Select preferred dates for the travel lift job(s) required. I acknowledge that I have read the Travel Lift Terms and Conditions. I accept the Travel Lift Terms and Conditions.